KA is an action-loving, adventure-seeking show. The entire theater is designed to fit the theme of good versus evil. Save up to $72 tickets, discount varies by seating type. 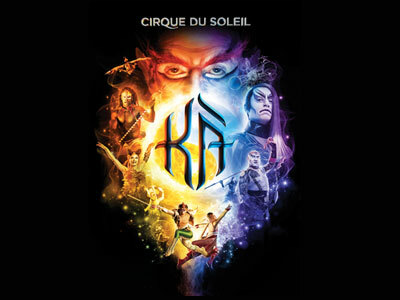 Save with insider pricing to see KA at the MGM Grand. No code needed to book, just click the link to get the discount. Rates start at just $93/ticket before fees and taxes. Get your tickets today for all performances of KA at MGM Grand. Rates for the show start at just $69 before taxes and fees. The KA Theatre is an experience unto itself. 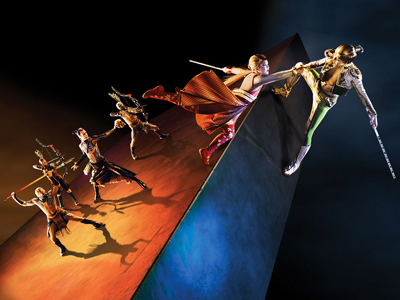 Once you enter for the evening’s performance, you are surrounded on both sides of the theater by scaffolding and acrobats dressed in tribal outfits yelling in cryptic tongues and jumping from platform to platform with the aid of bungee ropes. KA differentiates itself from other Cirque Du Soleil shows by being the only one in Las Vegas to have a definable plot and sequence of events. The story starts with two Imperial Twins that are separated after a warring attack on their palace and follows them on their individual journeys towards becoming reunited. 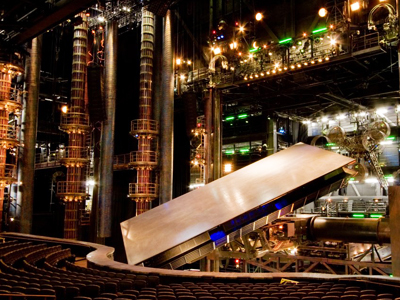 In addition to all of the amazing acrobatic routines that you would expect from a typical Cirque Du Soleil performance, there are many technical aspects involving the stage and surrounding set that help to tell the story and provide moments of awe. The stage itself has a full range of motion and transforms during the show into everything from a sandy beach to a weather-beaten sailboat. 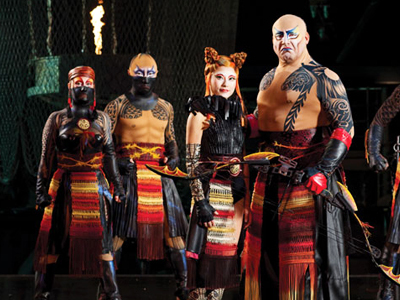 At no point during the show do any of the performers actually speak, rather their expressive performance and the show’s visually stunning effects help to propel the series of events in KA. 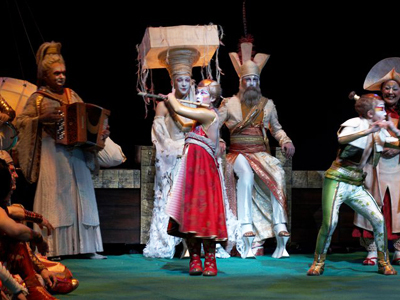 If you are looking for a show that fully removes you from the outside world and encompasses your senses and emotions with its unique style and beauty, then you should not miss out on an opportunity to witness the world of KA. I just loved this show. The costumes were amazing, and the music too! I would come back and see this for sure. To those of you who don’t know. There was an accident during the wall fight scene where one of the performers fell due to faulty wire. After the accident, they have replaced that fight scene with a screen showing the scene. Other then that it’s fine. Don’t try to follow the story because there really isn’t one. Our first cirque show. Going back In June to see another one. Then we can compare. It was amazing! I liked it. Our first cirque show and was amazed. I plan to go back in June to catch more shows to compare it with. We were concerned we would have trouble following the story and not enjoy the show. You only need to get the gist of good versus evil to enjoy. I kept finding myself saying the same thing with each scene — AMAZING!!! This Cirque du Soleil show is My Favorite! This show has so much diversity. It feels like we got a show from 10 different countries! This show played on my perspective in the way the stages moved and transformed, it was unbelievable! I left this production wanting so much more! This was such a Thrilling Show! Awesome show! Cool acrobatics, good story line to keep your interest. The stage is unreal!!!! This show was awful! I went with my boyfriend and a group of friends and most of us fell asleep. There were a few cool effects here and there but there was nothing spectacular about it. Would not recommend this show to anyone! Not a bad show, but was expecting more acrobatics. The set it unvaried and not as innovative as other Cirque du Soleil shows. What is shown works, but emphasis on a slower show with minimal stunts. Upside, cool individual speakers within each audience members’ seats to add to the ambience. Really enjoyed this show with my hubby! Worth the $$$$! I was expecting more acrobats and stunts. It was a lot of the same thing over and over again, lots of dancing and climbing this moving wall. There must be a better show to see. They were very talented performers, just change it up. The stage and theater alone made the whole thing worth it. Not a bad story line. Would like to have seen a few more challenging acrobats but still was not disappointed at all. Amazing show – loved the atmosphere created and the stunts – just simply awesome!!!!! It’s a great show. I highly recommend. The moving stage and performances are incredible. I was expecting KA to be better but it was very slow paced, not energetic at all and made me fall asleep. the good is the visual and audio effects of the show. I saw 5 cirque du soleil shows and this is the only one I won’t recommend to others. This show is truly on of the best shows in vegas! The stage transforms in front of you and you feel apart of the whole experience. Wonderful show! Do not miss! This was my first Cirque show and it did not disappoint! I was wowed by the acrobats, the costumes and the music. The moving stage scenes were another wow factor! At times the show was so busy, I did not know where to look next ! My only complaint was the story is hard to follow! The show was just impressive! The moving stage was the highlight of the show! The vibrant costumes, the great music! The show is great for families. I wouldnt hesitate to take my 10 yr old next visit!